Know someone whos not able to get out and enjoy the summer sunshine? 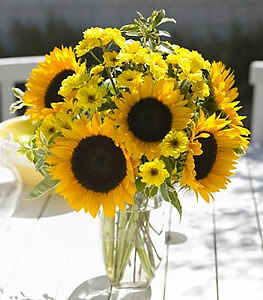 Send a vase full of indoor sunshine with this blazingly beautiful floral arrangement. A gift to warm any heart. A clear glass vase filled with large sunflowers and yellow chrysanthemums, accented with pittosporum.